A threat has been made to the heart of an old city, to a unique relationship between the people and their saint. The partnership has lasted through centuries of invasion, violence, disease and volcanic turbulence … but now bureaucracy wants its say. 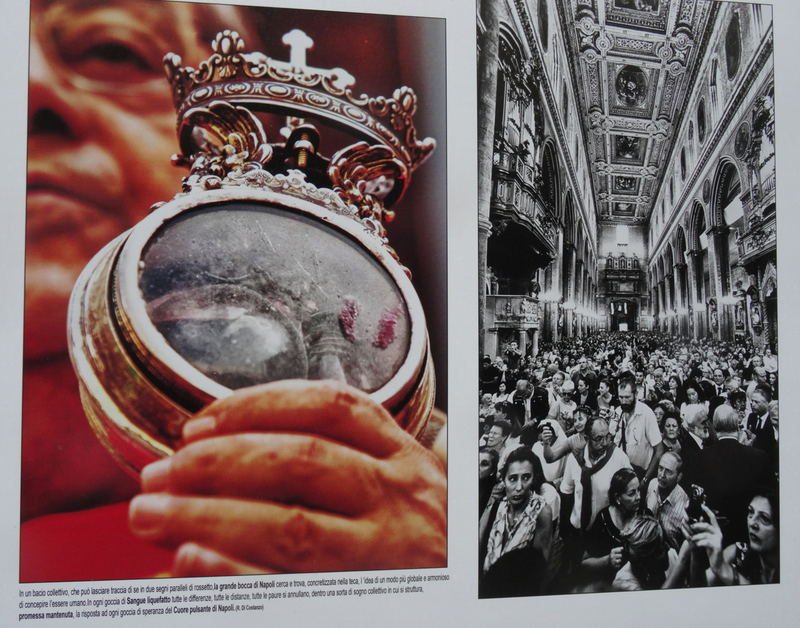 The challenge is to the arrangements in place for the care of the patron saint of Naples, San Gennaro, and his glittering collection of treasure. The guardians of San Gennaro are representatives of the people of Naples and members of the city’s noble families … not the Church. However, recently the Italian state has moved to change these arrangements to include four members of the Curia (those who administer the Roman Catholic Church) … and Neapolitans aren’t happy. The link between saint and city goes back well over a thousand years. Januarius, known later as San Gennaro, was a young bishop from Benevento who was executed during the persecution of the Christians under Roman Emperor Dicoletian. The date given for the bishop’s death is the 19th of September 305 AD, and it took place at Solfatarra in Pozzuoli, not far from Naples. Two phials of the beheaded bishop’s blood were saved, and in the 5th century his body was moved to catacombs in Naples. Later, towards the end of the 1400s, his relics arrived at the city’s Duomo (cathedral). They arrived at a difficult time as France and Spain were at war with each other and the prize for the victor was control of the Kingdom of Naples. In the end Spain won, and Naples was forced to become a Spanish colony. A terrible period followed. 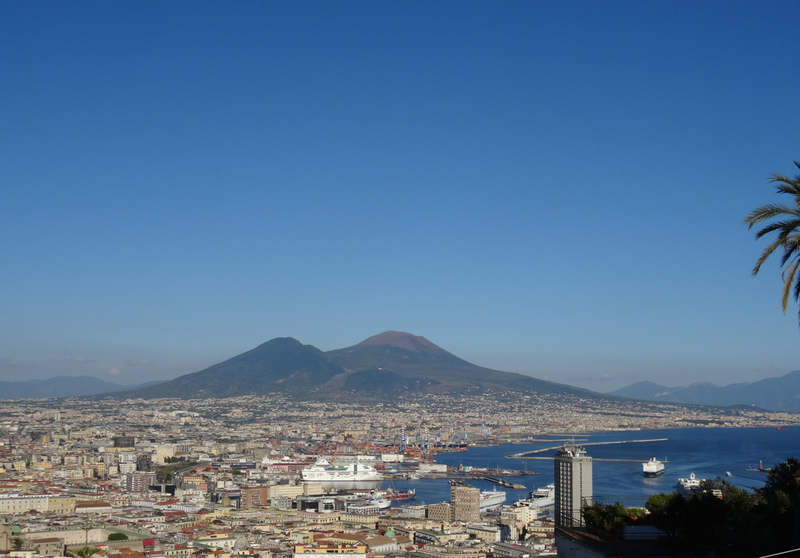 The city was faced with neglect and high taxes, a restless Vesuvius, and waves of disease, including an outbreak of the plague in 1527. The exhausted citizens turned to San Gennaro for help. Devotion to the saint grew, and included a vow that a chapel would be built in his name. Work began on the promised building in 1608, and by 1637, the Capella di San Gennaro in the Duomo was completed. The chapel still stands and alongside it there is now the Museo del Tesoro di San Gennaro, home to the saint’s rich collection of treasures. In this museum there is a document, drawn up by lawyers in 1527, that officially recognises the commitment by the people of Naples, not the Curia, to safeguard the chapel and its contents. The tesoro (treasure), dedicated to one saint, San Gennaro, has been invested over centuries with the prayers of a city that was once amongst the most powerful in Europe. It is rich with supplications from the poor, and with valuable donations from the powerful. 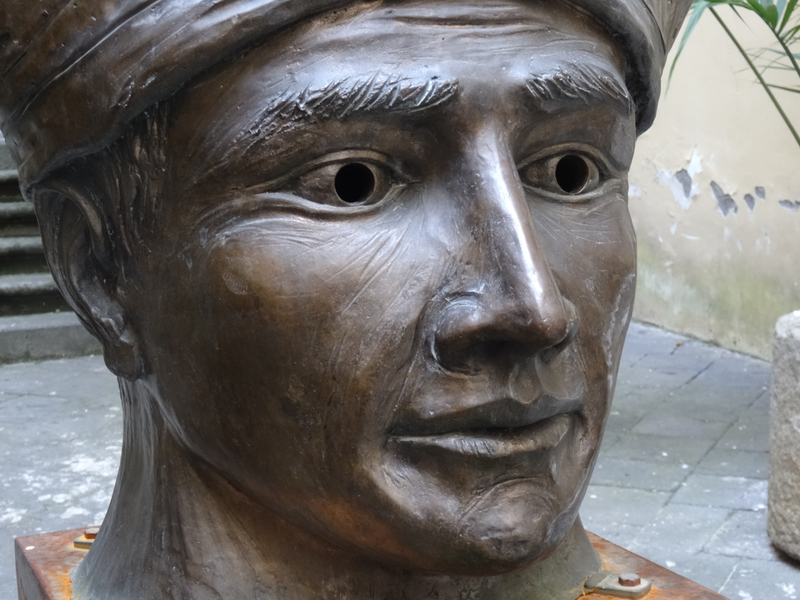 Much has happened since the official agreement of 1527 but the people of Naples have honoured their duty of care to San Gennaro … and most believe that he, in return, has kept an eye on them. The relationship has evolved over the years, but still constant is the repeat miracle of liquefaction. Several times a year, with the 19th of September being of particular importance, a phial of the saint’s blood is presented before the people at a ceremony in the cathedral to see whether or not it will liquify. Failure to do so is seen as a bad omen for the city. Scepticism about the miracle might be on the rise, but the encouragement a successful liquefaction gives is indiscriminate. Naturally, with so much history and hope at stake, Naples is sensitive to any interference in its special relationship with San Gennaro. The city does not want the committee of 12 lay representatives, who administer the saint and his treasure, to be interfered with. The Church has never been involved and moves to include the Curia now are met with suspicion. The proposed changes to the committee would, according to Naples, break the original legal agreement and be seen as an assault on the cultural and spiritual identity of the city … and on its pride. 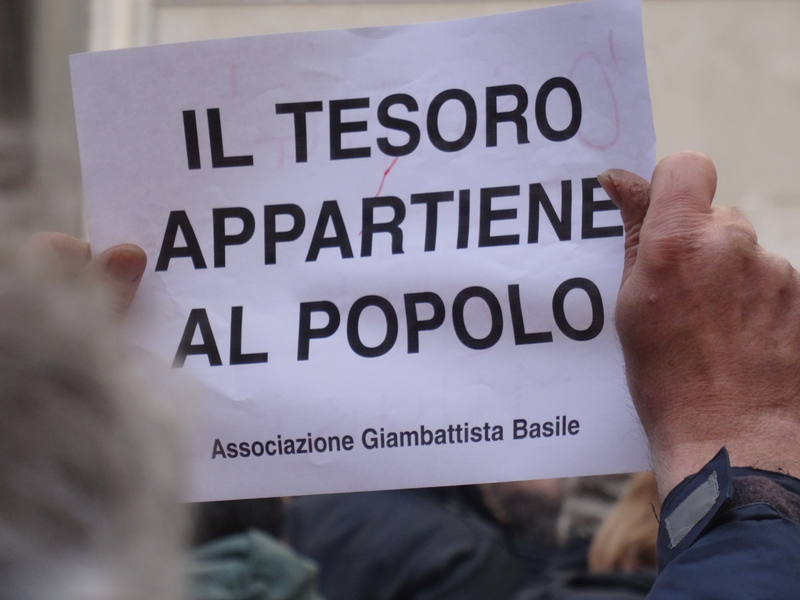 The polite message from Naples to those who would interfere in the city’s relationship with San Gennaro: “The treasure belongs to the people”. The reverse was not so polite. The situation must be awkward for the Curia, particularly as the Chapel of San Gennaro lies within the walls of the Cathedral in Naples. 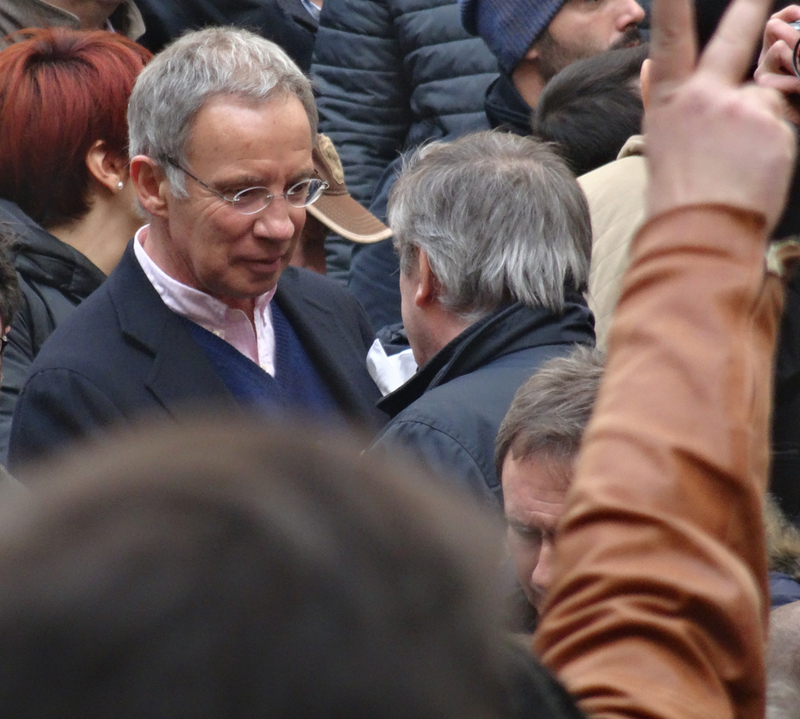 Naples, however, is adamant that no outside interference will be tolerated and, to make this clear, hundreds of protestors met on the steps of the Duomo in the city on the 5th of March 2016. Social media had spread news of the protest in advance, and on the day loudspeakers and leaflets underlined the objections as the well-mannered crowd made its feelings clear. The crowd was mixed, men and women, old and young, and the atmosphere was peaceful and informative – “molto educato” as requested. There were several Bourbon flags on the steps. This flag, dating from the time of the Kingdom of Naples (also known as the Kingdom of the Two Sicilies) 1735 – 1860, includes the order of St Januarius. 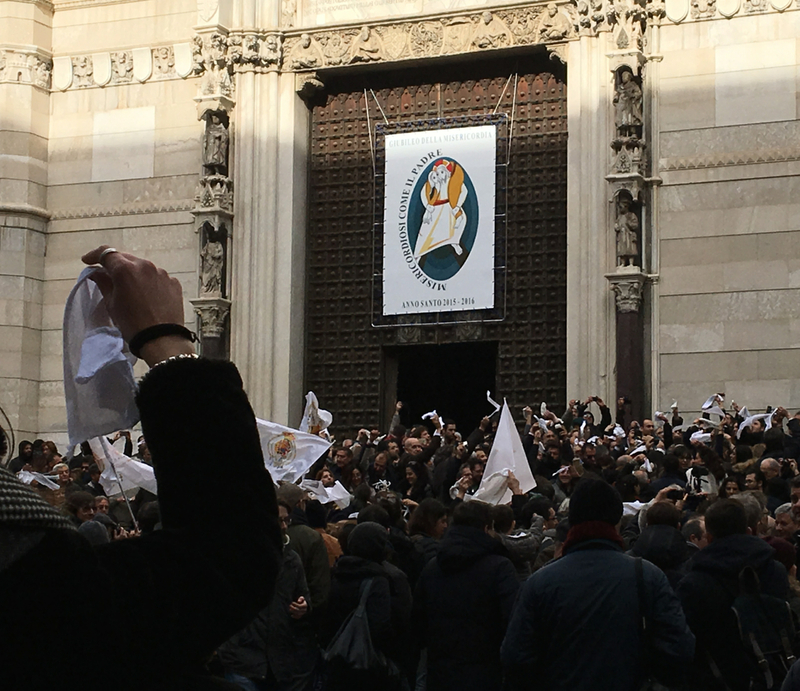 Also waved were white handkerchiefs, traditionally associated with the successful liquefaction of the blood of the saint, but used on the day of the protest to flash a clear message of alarm around the world. Now, a fortnight after this demonstration, there seems to be a period of calm as the lawyers do their work. 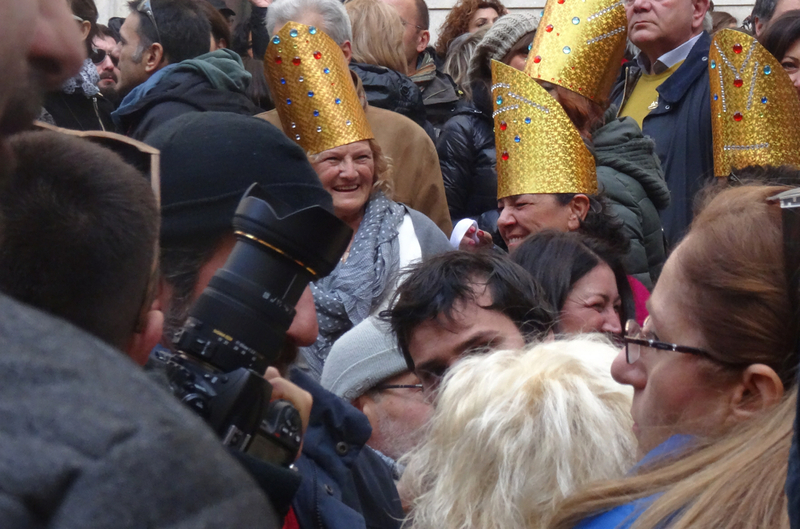 Those who represent Naples will try to prove that the group who guard San Gennaro and his treasures are chosen under a particular system, agreed and overseen by the city, and that because of this Naples cannot be forced to accept the rules of membership that the Curia, and the state, would like to apply. 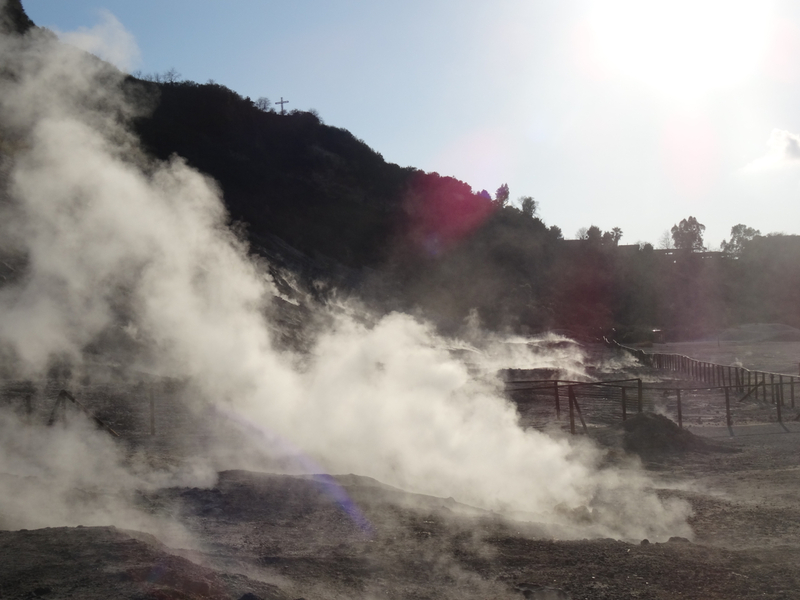 In short that this is between San Gennaro and Naples, and has nothing to do with the Curia. We wait to see what will happen. 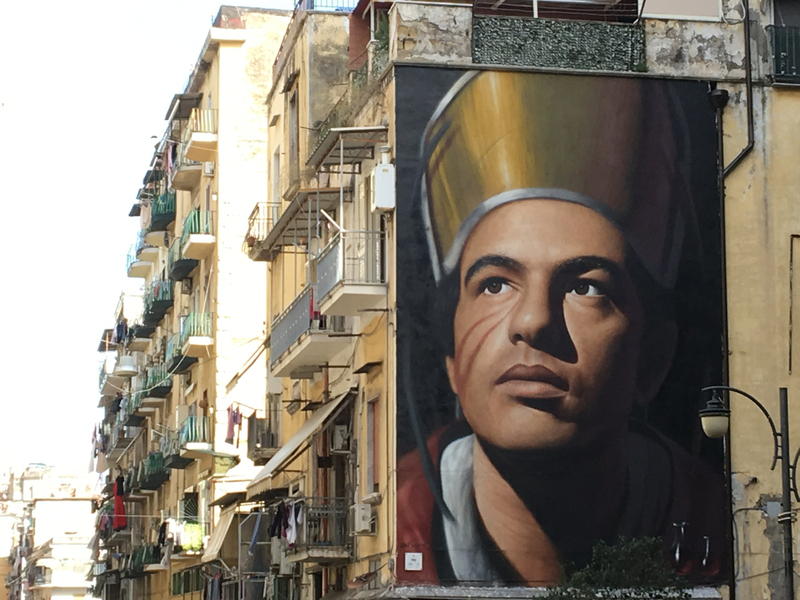 All that’s clear is that for the people of Naples, both the saintly and the not-so-saintly, this battle over San Gennaro is as much about pride and cultural identity as anything else. 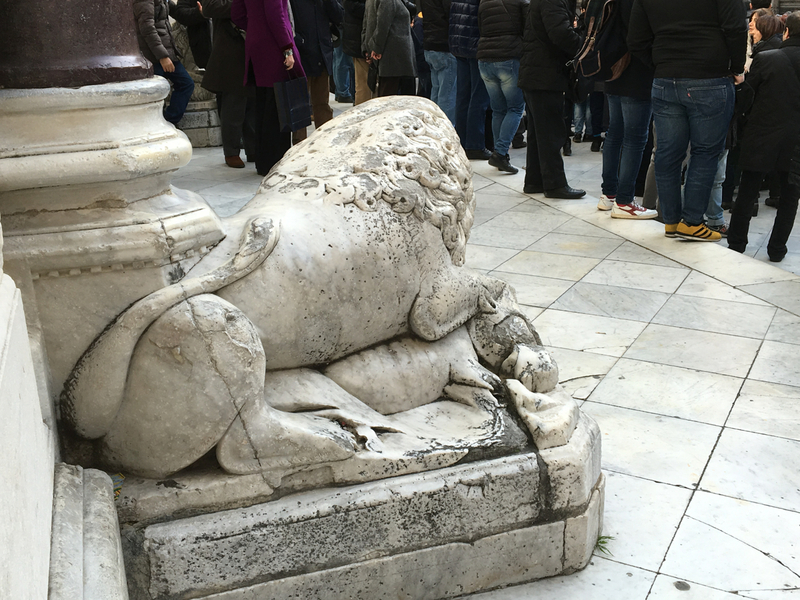 This entry was posted in Italy, Naples, San Gennaro and tagged Cappella di San Gennaro, Diocletian, Duomo, Januarius, miracle, Pozzuoli, San Gennaro, Solfatara, treasures, Vesuvius. Bookmark the permalink. I wrote this piece in March 2016. 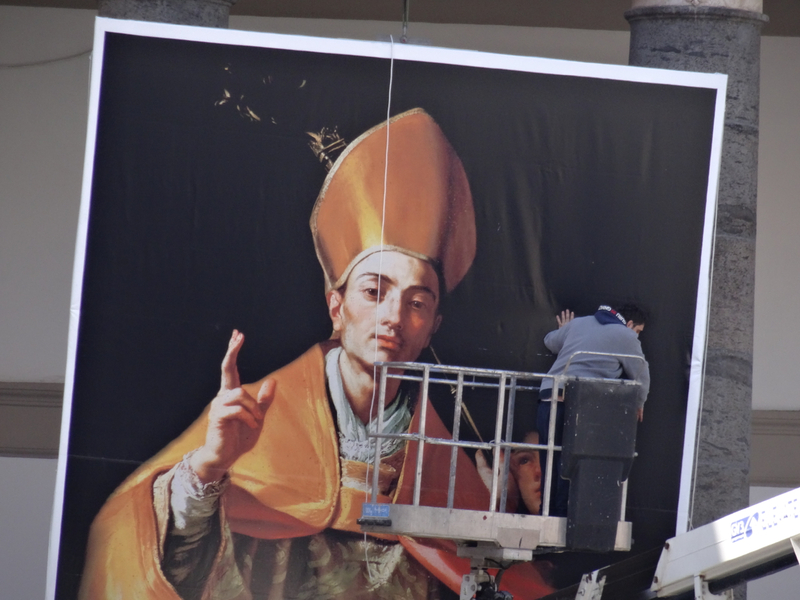 It gives the history of San Gennaro, the patron saint of Naples, and covers the storm that raged over the threat to the city’s custody of the saint. What a fabulous post, I feel like I am there. 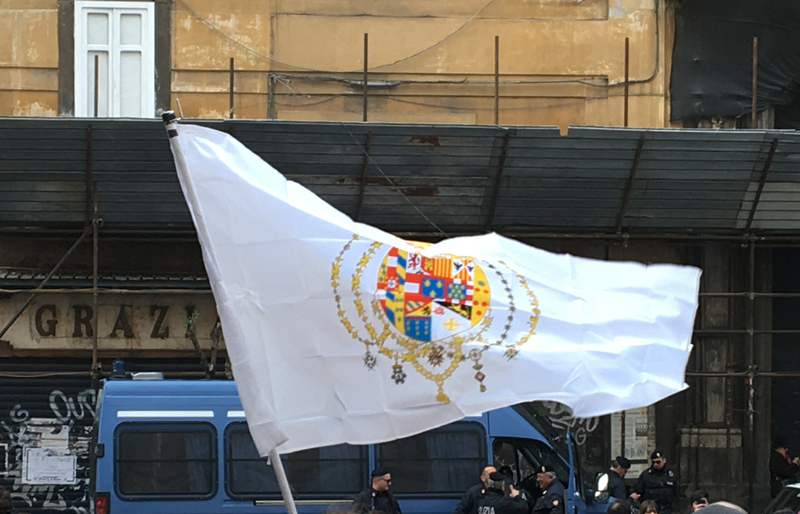 I am so excited by the flag of the kingdom of two Sicilies that I am going to do a google to see if I can order one from somewhere :), and also enjoyed the clip of the 2 blokes, really entertaining. Thanks so much! I am so delighted that you like the flag – took me a while to find out where it came from and, as so often with Naples, I found much of the information on the website run by Jeff Matthews: Naples, Life, Death and Miracles. Well worth a look if you have the time. Finally (but definitely not least) I am really happy you found the video – I smile every time I watch it.